The President of the United States offended another ally with a message about the withdrawal of American troops from Syria. Earlier, the White House’s decision was criticized by the Kurdish National Self-Defense Detachments (YPG), which can now become easy prey for Turkey, and then for Israel. 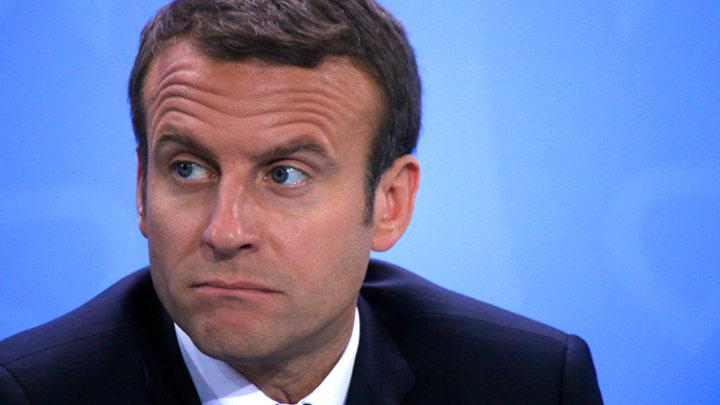 Now French president Emmanuel Macron is indignant. What is he dissatisfied with? It is worth noting that Emmanuel Macron was one of the few European leaders with whom Donald Trump got along. At the talks, they politely called each other just friends. But about a month ago a black cat ran between them. When the French president proposed to create a European army and defend it against the United States, Trump went berserk. The owner of the Oval Office advised his “amie” to take care of the rising costs of defense and the combat capability of NATO. Pissed off Trump decided to teach a thankless friend. Trump did not disguise his sympathy for the "yellow vests." In response, the owner of the Elysée Palace recommended the NATO partner not to interfere in the internal affairs of France. Another blow to Paris, Trump struck recently, announcing the withdrawal of US troops from Syria. Now the American president turned out to be a traitor. I am very disappointed with the decision taken on Syria. Being an ally means fighting shoulder to shoulder. This is the most important thing for the head of state and the military commander. An ally must be reliable - said Macron. The fact is that in the territories from which the States leave, there are up to a thousand French military and instructors. They train Kurdish militants from YPG. When Turkish President Recep Tayyip Erdogan threatened to enter Manbij in the spring, the French urgently sent there helicopters and special forces, and together with the American commander and assured the Kurds that they would take care of their security. After leaving Syria, the Americans will leave helpless not only the Kurdish allies, but also the French. Having received agreement from the Kremlin, Erdogan could soon go on the offensive to the east of the Euphrates. Alone, without the United States, the French will not risk resisting another NATO ally, Turkey. In the end, the French, like the Americans, will also have to leave. For France, the preservation of influence in Syria is not only a question of money centered on the lands of the YPG of oil or control over the Chinese Silk Road, but also of prestige. Because the modern Syria as a state was created by the French in the territories that were ceded under their control when the Ottoman Empire was divided under the 1916 Sykes-Picot Treaty. The withdrawal of the United States, and after them France, will strengthen the positions of those remaining in the Arab country of Russia, Turkey and Iran. Now there will be no extra players on the ground, and it will be much easier for Putin, along with Rouhani and Erdogan, to agree on the restoration of the territorial integrity of Syria. As for the Europeans, they will still be involved in the Syrian issue. At the summit in Istanbul, Putin and Erdogan have already offered Macron and Merkel to invest in the Syrian recovery. But then the French and German leaders refused and demanded political reforms, that is, the departure of Bashar al-Assad. Now, when the alignment of forces is even more inclined not in favor of NATO, the Europeans, if they hope for at least some influence in Syria, will need to be more open to dialogue with the participants of the Astana format. Europe already in September felt how her fate depended on Putin and Erdogan. If it were not for the agreement on the demilitarized zone concluded by Moscow and Ankara, several hundred thousand Syrians would have already arrived in the Old World. If the Europeans do not want new refugees, then sooner or later they will have to allocate funds to rebuild their own destroyed Syria.